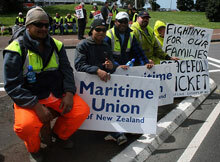 In case anyone hasn’t noticed, the Ports of Auckland have been ground to a halt by strike action from 250 members of the Maritime Union. These guys are on as little as $13 an hour and have had their pay negotiations stalled by the company for nearly a year, so you can hardly blame them for losing their patience. Predictably, the usual suspects are complaining that the strike is irresponsible because it’s disrupting business – seemingly forgetting that this is precisely the point of going on strike. As Denis Carlisle from the union said, “Our labour is the commodity we sell, and we will offer that labour at the value that we think it is worth.” So if farmers and exporters are so aggrieved about having their goods held up, why don’t they go have a word to the Ports of Auckland and tell them to pay their workers properly? Because the reality is the union’s claims are actually pretty reasonable. All they’re asking for is a backdated pay rise of between 4.5-4.9% and an extra week’s leave, but the company has refused to go above 3.25% and even unilaterally deposited the increase into the workers’ bank accounts to try and undermine bargaining. They’ve now trespassed all striking staff and are running the line (dutifully picked up by TV3 last night) that the union is asking for 15%. There are pickets going 24/7 and these will run until 7am tomorrow morning when the first round of action comes to an end. So if you’re in the area, why not drop by and give them some support? Just watched the TV3 clip. Is that Jesse Peach like 12 years old or something? This thread on another post is the complete opposite of what you are claiming the strikers are being paid! So who is telling the truth I wonder. This blog which is simply a mouthpiece for the Beast or the other one which while being right leaning is not part of the liarbour propaganda machine.